1/24 POLICE CHEVY TAHOE 2008. By WELLY.RARE. NEW IN BOX !!! SHIPPING TO UNITED STATES ONLY..... THIS IS A : 1/24 CHEVY TAHOE POLICE TRUCK 2008 by WELLY DIECAST MODELS. IT IS BRAND NEW .... THE BOX IS SEALED BY CLEAR FACTORY TAPE AT BOTH OPENING SIDES AS YOU CAN SEE AT BOTH LAST PICTURES.... THAT MEANS THAT NEVER HAS BEEN OPEN.THERE IS : NO RETURNS AT ALL.... ANY QUESTIONS OR CONCERNS CONTACT ME BEFORE YOU PAY FOR IT .. THANKS FOR LOOKING ! 1:24 Scale Diecast Car. WE HAVE LARGE SELECTION OF DIECAST CARS. Competitive Pricing and Unrivaled Selection We are the number one direct distributor of diecast model cars in the USA, so we are able to provide very competitive pricing. Detailed interior, exterior. 1:24 scale Norscot Chevrolet Tahoe LTZ silver diecast model for police custom? 2015 CHEVY TAHOE LTZ. Beautiful model and getting harder and harder to locate. Get while the gettin's good! opening hood, front doors and liftgate. Manufacturer: Welly. We are not responsible for your assumption. Color: Black. Scale: 1:24. 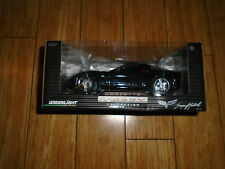 UP FOR SALE IS A NEW IN BOX GREENLIGHT CHEVROLET CORVETTE SUPERNATURAL THE CAR IS NEW THE BOX IS NEW A GREAT PIECE. Gloss black with red/white racing stripes and extra wheels. Box may have minor wear. Jada 1:24 1955 Chevy Belair Dub City / OldSkool. Orange Metallic! New! Mint! 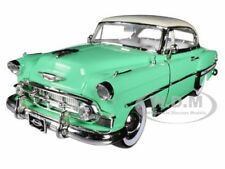 Jada 1:24 1955 Chevy Belair Dub City / OldSkool Edition car. Early Release and No Longer Produced! Mint Condition! Factory Sealed! Competitive Pricing and Unrivaled Selection We are the number one direct distributor of diecast model cars in the USA, so we are able to provide very competitive pricing. And now, we hope to have the chance to prove we are the best to you! (NO WINDOW BOX ( Item# 99975DP1 ). Made of High Quality Diecast. 2,) Opening Doors, Detailed interior, exterior. Opening Hood Detailed Engine. Has opening hood, doors and tailgate. Competitive Pricing and Unrivaled Selection We are the number one direct distributor of diecast model cars in the USA, so we are able to provide very competitive pricing. 1975 Chevrolet Corvette Stingray L-82 Convertible. 1:24 Scale Danbury Mint. Made By Jada. 1961 CHEVROLET IMPALA. Color White. Maisto Scale 1:24. What you see in the photos is what you will receive. Maisto 2015 Chevrolet Corvette Stingray C7 Z06 1:24. Scale: 1:24. Exterior Color: Yellow. Open Hood, Doors. Manufacture: Motormax. Reason to buy from us. This product is not suitable for kids under age of 8. 1954 Chevrolet Bel Air Danbury Mint 1:24 Limited Edition 1 of 2500 Black. * driver side door sticks out a little Original box and paperwork not included. Manufacturer: Welly. We are not responsible for your assumption. Color: White. Scale: 1:24. Competitive Pricing and Unrivaled Selection We are the number one direct distributor of diecast model cars in the USA, so we are able to provide very competitive pricing. Has opening hood and doors. 1 24 DANBURY MINT 1953 CHEVROLET 3100 PICKUP. TRUCK IS GORGEOUS AND MINT IN MINT BOX WITH ACCESSORIES. Competitive Pricing and Unrivaled Selection We are the number one direct distributor of diecast model cars in the USA, so we are able to provide very competitive pricing. Opening hood, doors and trunk. The car is new in the box and has never been on display or played with. Opening Hood Detailed Engine. Opening Doors. Opening Tail Gate. Model No. 79648. Made By Motormax. 1966 Chevrolet C-10 Fleetside Pickup Truck. Gulf Oil Racing. Diecast Scale 1:24. Color White. Item Number: 22089. Competitive Pricing and Unrivaled Selection We are the number one direct distributor of diecast model cars in the USA, so we are able to provide very competitive pricing. Manufacturer: Jada. The details of this diecast replica are incredible! Features include: authentically detailed engine, interior, and chassis, fully functioning doors, hood and trunk, real rubber tires, free wheeling. 1992 Chevy 454SS diecast model pickup truck. Opening doors, hood & tailgate and workable steering ,hood with detailed engine. Highly Detailed inside with seats and steering wheel. Sons of Anarchy Chevy Sidestep. With a Harley Bike. Display only - this is not a Toy - Suitable for 10 years . THERE IS NO PICKUP FACILITY AVAILABLE. Manufacturer: Jada. G LGB 1:24 Scale 1948 Chevrolet Fleetmaster Woody Diecast Very Detailed Model 22083. A tough diecast model ideal for garden railways. SIZE 200 X 70 X 70MM. 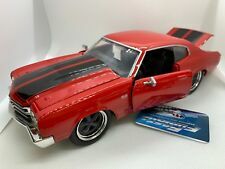 Pre Owned in Excellent Condition " A Very Clean Piece"
Competitive Pricing and Unrivaled Selection We are the number one direct distributor of diecast model cars in the USA, so we are able to provide very competitive pricing. Has opening doors, trunk and hood. USED,NO BOX, HAS A SCRATCH ON ROOF AND DOWN THE PASSENGER SIDE. Made of High Quality Diecast By JADA TOYS. and Jada Toys. Opening Hood Detailed Engine. Free Wheels, Wheels Roll. Made by Maisto this beautiful diecast model is strongly made Opening front doors reveal a detailed interior, drop down tailgate. Jada 1/24 Just Trucks Div Cruiser Skool Bus (school bus). Yellow with white roof. Lots of details. This was displayed in a glass case, no box. Just like new. Great for customizers of cars and trucks. nice detailed part. anywhere you may need a straight antenna. you need only ad wire to complete them.